and Singapore noodles for the Montague poodles! Molly likes her neighbours Maureen and Murray, so when Maureen goes to hospital, Molly decides to make a curry for Murray. Word soon gets out about her wonderful culinary skills, and soon Molly is cooking and baking for friends near and far. But in the midst of her cooking chaos, Molly hurts herself – and Mum says ‘enough’. Finally, when Maureen gets home from hospital, it is Molly’s turn to receive a food gift. 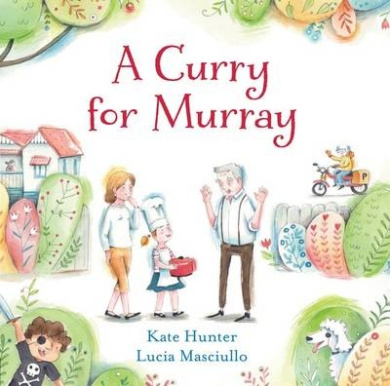 A Curry for Murray is a gorgeous new picture book with lots of food-based silliness in both text and illustrations. Alongside the fun aspect, there is also lots of information about food, with visual representations of the ingredients in each dish, and a lovely demonstration of community spirit. The food offerings, as well as rhyming with the recipient names, come from a range of different cuisines, and some of the food is sent to faraway places, offering lots of opportunities for discussion. The watercolour and pencil illustrations have touches of whimsy and lots of detail for youngsters to explore. From the cover through to the endpapers, this is a beautiful book to own and engage with.